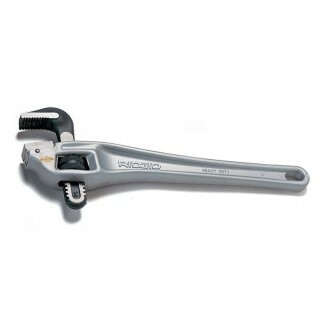 RIDGID 10 inch Aluminium Straight Pipe Wrench, Professional strength in lightweight aluminum. Offers the same durability and ease-of-use found in all RIDGID heavy-duty wrenches. 40% lighter than Heavy-Duty Wrenches. RIDGID 12 inch Aluminium Straight Pipe Wrench, Professional strength in lightweight aluminum. 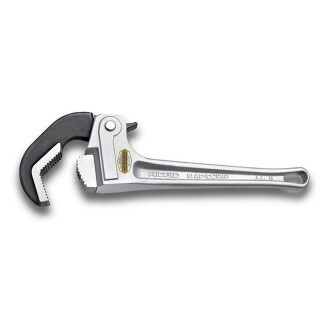 Offers the same durability and ease-of-use found in all RIDGID heavy-duty wrenches. 40% Lighter than Heavy-Duty Wrenches. RIDGID 14 inch Aluminium Straight Pipe Wrench, Professional strength in lightweight aluminum. Offers the same durability and ease-of-use found in all RIDGID heavy-duty wrenches. 40% Lighter than Heavy-Duty Wrenches. RIDGID 18 inch Aluminium Straight Pipe Wrench, Professional strength in lightweight aluminum. Offers the same durability and ease-of-use found in all RIDGID heavy-duty wrenches. 40% Lighter than Heavy-Duty Wrenches. RIDGID 24 inch Aluminium Straight Pipe Wrench, Professional strength in lightweight aluminum. 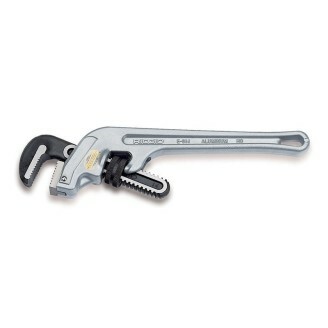 Offers the same durability and ease-of-use found in all RIDGID heavy-duty wrenches. 40% Lighter than Heavy-Duty Wrenches. RIDGID 36 inch Aluminium Straight Pipe Wrench, Professional strength in lightweight aluminum. Offers the same durability and ease-of-use found in all RIDGID heavy-duty wrenches. 40% Lighter than Heavy-Duty Wrenches. RIDGID 48 inch Aluminium Straight Pipe Wrench, Professional strength in lightweight aluminum. Offers the same durability and ease-of-use found in all RIDGID heavy-duty wrenches. 40% Lighter than Heavy-Duty Wrenches. RIDGID 14 inch Aluminium Offset Pipe Wrench, Features a jaw opening parallel to the handle and a narrower hook jaw head. Provides easy entry into tight spots. RIDGID 18 inch Aluminium Offset Pipe Wrench, Features a jaw opening parallel to the handle and a narrower hook jaw head. Provides easy entry into tight spots. RIDGID 24 inch Aluminium Offset Pipe Wrench, Features a jaw opening parallel to the handle and a narrower hook jaw head. Provides easy entry into tight spots. RIDGID 14 inch Aluminium RapidGrip Pipe Wrench, All the great benefits of the heavy-duty RapidGrip wrench. 35% lighter than heavy-duty models. Ideal for overhead applications. RIDGID 18 inch Aluminium RapidGrip Pipe Wrench, All the great benefits of the heavy-duty RapidGrip wrench. 35% lighter than heavy-duty models. Ideal for overhead applications. 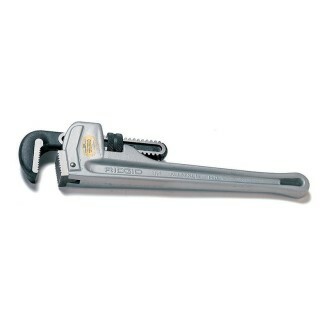 RIDGID 10 inch Aluminium End Pipe Wrench, Ideal for jobs in close quarters and over-head applications. Designed for easy access in close parallel lines. 40% lighter than heavy-duty wrenches. RIDGID 14 inch Aluminium End Pipe Wrench, Ideal for jobs in close quarters and over-head applications. Designed for easy access in close parallel lines. 40% lighter than heavy-duty wrenches. RIDGID 18 inch Aluminium End Pipe Wrench, Ideal for jobs in close quarters and over-head applications. Designed for easy access in close parallel lines. 40% lighter than heavy-duty wrenches. RIDGID 24 inch Aluminium End Pipe Wrench, Ideal for jobs in close quarters and over-head applications. Designed for easy access in close parallel lines. 40% lighter than heavy-duty wrenches.